Finding this old envelope prompted an hour’s prowling the Internet. This much I know: On April 30, 1932, a Mrs. Lübbert dropped a letter in the mail in Königsberg, East Prussia. Thirteen years later, a rhinoceros in the nearby zoo caught some bullets as the Russian army overran the city. And the internet is how, on my desk in Albany, these two unrelated events got figuratively linked. 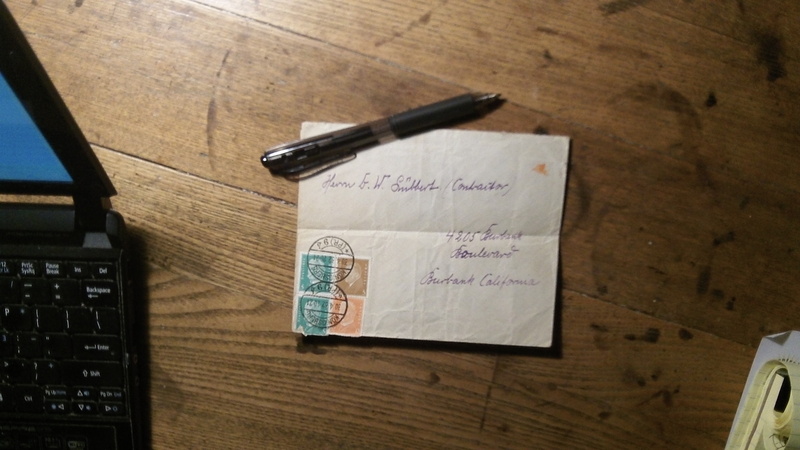 The letter from “Frau Lübbert” was addressed to “G.W. Lübbert (Contractor)” on Burbank Boulevard in Burbank, Calif. As I was moving stuff around on Sunday, the envelope — minus whatever it had once contained — fell out of the pages of a stamp album that was among the things of my late mother-in-law. The album had belonged to her brother, also deceased. Brother and sister grew up in Burbank. He collected stamps, and I’m sure the envelope was given to him because of that. There are four stamps on it, three with a portrait of Hindenburg, the German president in 1932. The face on the fourth I didn’t recognize. I looked up the Burbank address where G.W. had lived or worked. Whatever was there in 1932 is gone. Today it’s the office of a tax accounting firm, a one-story storefront in a row of commercial buildings on what now is called West Burbank Boulevard. The return address on the envelope was on Tiergarten Street in Königsberg, now Kaliningrad. From the name of the street, I figured it must have been near a zoo. And yes, Google helped me find the Kaliningrad Zoo, now said to be one of the biggest in Russia. It had in fact been founded as the Königsberg Tiergarten in 1896. The zoo was closed during the First World War, and after it was reopened, only four of the animals survived the Second, a hippo among them. “The hippopotamus was in an especially bad state, having received seven stray bullets when the Red Army stormed the city,” Wikipedia informs us. One Vladimir Petrovich Polonsky, a “livestock specialist,” is credited with nursing the animal back to health. 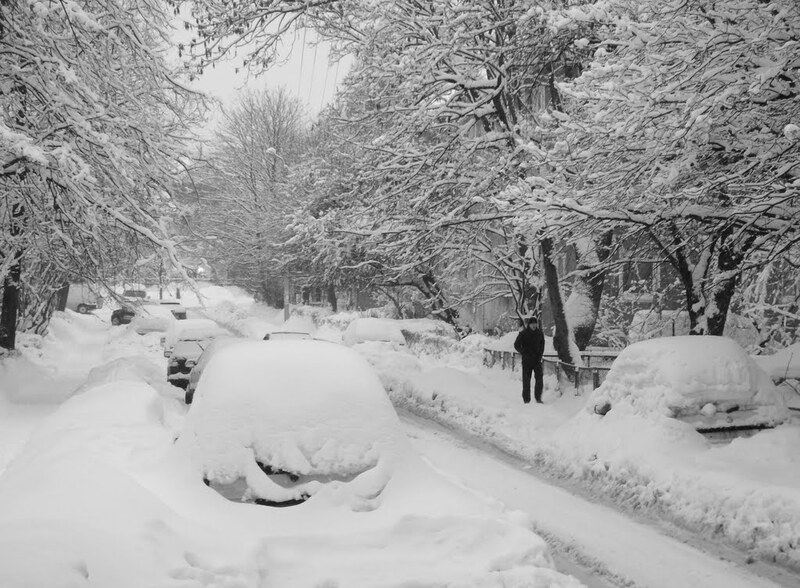 Also online, I found a photo of the former Tiergarten Street in winter, blanketed by snow. Now it’s called whatever “Zoo Lane” is in Russian. Zoo Lane in 2011: The 1932 letter was mailed from near here. A nice tale. Thanks for the history. The world is ever smaller, and the Internet accelerated the phenomenon tremendously. Interestingly enough, “Zoo Lane” translates in Russian to “Zoopark Leyn” (english) or “Зоопарк Лейн” (cyrillic), courtesy of my wife. In fact, it is surprising how many words in the two languages sound almost the same. You mentioned how hard it was not that long ago to communicate from opposite sides of the world. Contrast with today….my wife, a Russian national with permanent resident status, communicates with her son and family, brothers, and friends in Russia in real time on Skype with video, ala George Jetson. It’s almost like being in the same room. Likewise for me and a long time friend in New Zealand. How far we have come! Now, if I only had a car like the Jetsons had…. This past spring I found an old letter, from 1917, in an old book of mine. It was addressed to a Reverend Al Green, of Cuba, Ill. It was in an H.G. Wells book, “God, the Invisible King”, and it thanked the lender of the book (Al) for loaning it to his friend. But it was a longish letter, not just a thank you note, discussing the religious thoughts in the book. “I am going through my old books, and found one that was owned by the Rev. Alden J. Green, from 1917. It also contains a personal letter written to him by a ‘J.P. Winter.’. The book is also inscribed ‘Cuba, June 1917, Alden J. Green’. It looks like this is your Alden J. Green from your genealogy site. I’d be happy to send you (for free) the book and letter if someone in his family would like to have it. It looks like his son and daughter are not alive anymore, but perhaps some other descendant or relation would value it. So the book is packaged up in brown paper wrapping in my living room, and shall be dropped off at the post office today. As someone who enjoys the written word — books, letters, it seems nice to reunite a letter and book back to a family after almost 100 years.